Do you want outstanding and well-shaped eyebrows? No more using tweezers to shape your eyebrows? It is possible with permanent makeup for the eyebrows. This form of make-up brings color pigment in the skin underneath the eyebrows, giving your eyebrow a fuller look and they are always in good shape. It draws attention to your eyes, the place you want attention. It has become a common phenomenon, especially in young women. But make no mistake, men and the elderly also are getting permanent makeup. 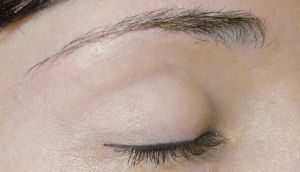 Why get permanent makeup for your eyebrows ? Because the eyebrow is permanent, you will get up in the morning with beautiful eyebrows. You do not need to get them in the right shape anymore. Shaping your eyebrows is easy, because it is all ready in perfect condition . You can spend this time better on choosing your perfect outfit. Your eyebrows don’t have to be dyed anymore. Some people have a shortage of eyebrow hairs, or the hairs are too thin. 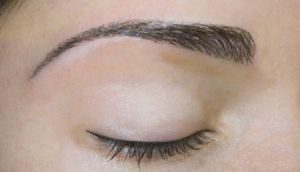 Permanent makeup for eyebrows can ensure that they look normal because the make up fills up the gap. This makes them look darker and fuller. Dyeing your eyebrows becomes unnecessary. There is a risk that the permanent eyebrow creats a skin reaction. In some cases, the skin reactions can lead to skin flakes, blistering, infection, or permanent scarring. You can not change the shape. So if you have chosen angled eyebrows, they will always stay this way. Some people have natural full and beautiful dark eyebrows. Or they have them because a permanent makeup procedure. When your not satisfied with these eyebrows, they can be made lighter. In this procedure pigment is placed in between the eyebrow hairs so that the eyebrows look lighter and less full. Ofcourse can light eyebrows be made darker too. This technique is to ensure that the shape of the eyebrows become established. The eyebrows are arranged that the shape is constant, smooth and in shape. The natural lines of the eyebrows are retained, so that the eyebrows fits the face. The color is adjusted to the existing hair. It creates beautiful eyebrows . There are people who have ” holes” in their eyebrows. Local shortage of eyebrow hairs or scars are reasons for this happening. With this technique, an implementation with permanent makeup can be done on the place of these ” holes”. Your eyebrows will be whole and in shape again.